Home How It Works Four Easy Steps Testimonials Order Now! The key to the LASIK@Home system is the Scal-Pal™ Scanning Adjusting Laparascopic Personal Laser. This hand-operated combination femtosecond/excimer laser is made exclusively for LASIK@Home by Walton Group Manufacturing, the same company that makes the the LASIK equipment used by more clinics nationwide. LASIK@Home is 100% safe, but is only possible with the Scal-Pal™ laser. Do not try this with any other device. IMPORTANT: Do not point any other laser (including laser pointers) at anyone's eye. Do not look directly at any laser. 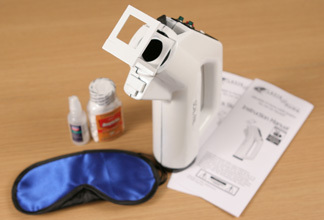 The Complete LASIK@Home Kit (patent pending) includes everything you need to complete the procedure. LASIK@Home takes the mystery (and expense!) out of complicated LASIK procedures. Thanks to the Scal-Pal™ laser, you can go from blurry to clear vision in just four easy steps.